I’m sure everyone is well aware by now how much I love reproducing children’s art in handmade keepsakes or as something a bit more useful. However when I was recently approached to reproduce something from a hand-made wedding invitation to be made in to a keepsake wedding gift for the bride, I couldn’t refuse. Mr Beanie and I had an exceptionally small wedding and given that more than half of the attendees were children, we had very few gifts at our wedding, but it was enough to know that a present with real heart and thought is rare. 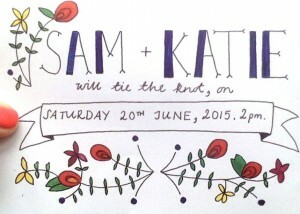 I was contacted on Facebook by someone asking if I would be able to reproduce some flowers that her sister had drawn on the invitations to her wedding. 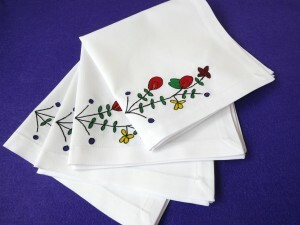 She had a few ideas about what she wanted and when we’d agreed that she would like it done on a handkerchief, I sent her some possible designs. We then talked about the designs and what she thought her sister would appreciate most as well as which one captured the original picture. In the end, we decided on lifting the entire picture and reproducing it in full across the bottom of a set of napkins for everyone at the ‘top table’. The final product came out wonderfully! 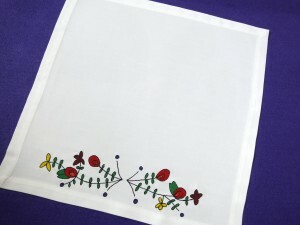 I will be posting a few more custom keepsakes that I have hand made for other celebrations recently in the near future. I might even add a page to my shop if I can get Mr Beanie to work his technical magic, where I can show off all of these in one place!